Ok, so this is a bit of a cheat as the gnocchi aren’t homemade but it’s still damned good and let’s face it, sometimes needs must! It’s such a quick and easy dish and the soft pillowy gnocchi with the garlicky sauce and oozy cheese are the perfect comfort food after a busy day. Glass of red wine mandatory. Put a large pan of water on to boil and add a good pinch of salt. When boiling, add the gnocchi and cook according to packet instructions. They usually only take about 3 minutes – once they have all floated to the surface you’ll know they’re ready. Drain and set aside. In a large non-stick frying pan, heat a good splash of olive oil and add the gnocchi. Fry over a fairly high heat, stirring occasionally, for a few minutes until they start to crisp up. Add the butter (this helps to achieve a nice colour) and keep frying until they are golden brown. Add the garlic, tomatoes and pinenuts and continue frying over a medium heat until the tomatoes start to break down and create a sauce. Add the parsley and mix well. 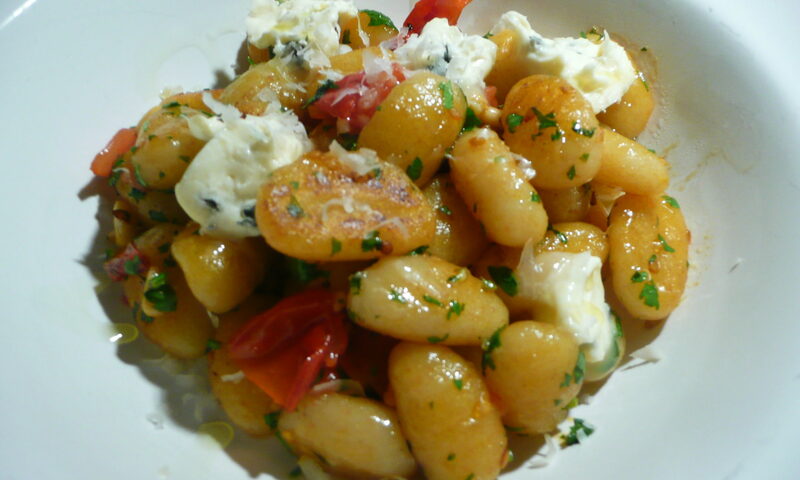 Serve immediately in bowls with the blue cheese dotted over the top – it will start to melt immediately into the gnocchi. Sprinkle over the parmesan and finish with a grinding of black pepper. Enjoy.